If you have been in a car accident or involved in a major personal injury, let the team at the BAC Clinic of Chiropractic help you start on the road to recovery. We offer personal injury Chiropractic care and will work with you to file the necessary insurance claims needed. You are already dealing with the added stress of an injury and possible trauma from your accident. We want your focus to be on your recovery and receiving personalized treatment rather than worrying about dealing with insurance companies. It is often that patients will come to our clinic after having X-rays taken at the hospital following an accident. 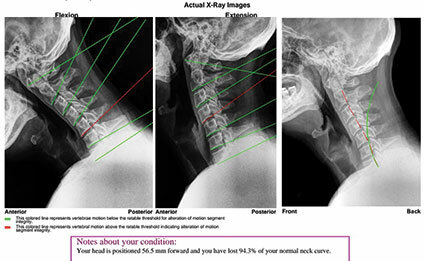 Although the radiologists at hospitals are more than qualified to identify any fractures, tumors, or pathology, the BAC Clinic of Chiropractic is on the forefront of whiplash injury analysis in Siouxland by using Posture Ray X-ray evaluation software. With our digital X-rays we are able to objectify your injuries to their full extent and identify what often times goes unnoticed by most radiologists so that you get the proper treatment needed to restore your spine to normal health. After identifying the extent of your injuries, your doctor will set a course of care for you to restore normal motion into your spine, and reduce inflammation that often results from injuries. Your doctor will use a combination of spinal adjustments, and non-invasive passive modalities such as ultrasound, DRX-9000 decompression therapy, massage therapy, laser therapy etc, to reduce your symptoms without the use of medication or drugs. Once your pain levels have been reduced to a relatively tolerable level, your doctor will transition you into an active phase of rehabilitation to strengthen your spine back to normal levels. In the event that you have sustained an injury that alters the overall structure of your spine, it is possible that adjustments, and strength training is not enough to get you back to pre-accident status. The BAC Clinic of Chiropractic is the ONLY clinic in Siouxland that offers non-surgical spinal reconstruction in the form of Chiropractic Biophysics (CBP). With 3 generations and over 40 years of experience, the Chicoine family and the BAC Clinic team is dedicated to giving you the highest quality of care possible to restore your spine to normal.